Click on the button to check out my YouTube Videos. Thank you for visiting my website and I hope you enjoy viewing my metal detecting and treasure hunting finds. A little bit about my metal detecting history. My name is Rob Hill and I live in Orlando, Florida. I received my first metal detector in the year 2000 as a Christmas present from my wife. It was a Bounty Hunter Discovery 2000 from Radio Shack. Little did she or I know that metal detecting would become an obsession of mine in the future. I played around with it periodically in yards & parks for years and finally got real serious about detecting in 2009 once my kids completed their High School sports. I was involved in youth baseball for 20 years, coaching most of the time. Once my kids were grown up, I was twiddling my thumbs with a loss of what to do in my spare time so I got the old metal detector out of the shed to play with and I haven't put it down since. 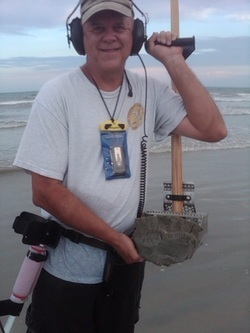 With a hunger for knowledge I joined The Central Florida Metal Detecting Club and made a lot of new friends. These friends taught me a lot about metal detecting. Once I joined the club I immediately purchased a Garrett Ace250. Not long after that I added a White's DFX. My arsenal now also includes a Whites V3i', a Fisher CZ-21, a Minelab CTX 3030 and yes, I still have my first machine, the Discovery 2000 although it is retired. On the norm, I go out detecting every Wednesday and Saturday. I own my own Printing, Signs and Promotional Products Company which keeps me very busy but even with that I find myself day dreaming while at work about where my next hunt will be. I initially started out hunting just local parks, schools and old homesteads but have expanded to water hunting, Civil War relic hunting in Virginia and even treasure hunting in the UK. It's an incredible hobby that provides a new RUSH every time you uncover that old coin, that Gold ring or that old artifact..........Thanks for visiting my site. 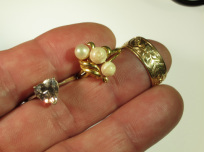 About My Home Page Picture...I recovered 3 Rings from the Same Hole! This was one of my favorite days of local tecting so it was fitting to use this picture as my home page banner. I visited an old park right downtown that I have been to before. About a year earlier in that same park I found a very old, very large silver ring with 7 CZ stones so I thought I would try it again. This park is just a lake that you can walk around but most people lay out on towels and blankets just to enjoy the scenery. I began hunting the exact same area where I had previously found the silver ring and managed to find some old clad coinage. I wondered around the lake and then headed back after about 2 hours. I was fixing to head out but made my way back to the initial search area I was tecting in for one last try. I came upon a large fire ant mound that I had avoided just a couple hours earlier. I stay away from those fire ants as they bite and I don't like to get bit! For some reason I decided to scan over the ant bed and when I did instantly got a hit. My VDI numbers were jumping around and I was trying to nail it down but was having a hard time separating the signals as there was multiple targets. I finally saw a vdi 47 on the Gold (blue) frequency and decided to dig, even in the ant bed. Quite honestly I do not usually dig when I get so many varying signals but this one just said "dig me". I usually get on my knees but with all the ants I just bent at the waist and dug. My first scoop of dirt yielded nothing but with the next scoop out popped an 18K gold ring with 3 pearls attached. I could plainly see it was gold but I didn't realize it was 18K until later in the day. Of course I was thrilled but the best was yet to come. As I got ready to refill my hole with my foot (remember all the ants and they were going crazy right about now so no way I am kneeling) I ran the 10" coil I was using over the dig area again. Still multiple targets so I dug. Quickly out popped a quarter. Another scan revealed still more targets. Once again I bent at the waist and dug down about 4 to 5". Out popped a beautiful silver ring with a large heart shaped stone, bright pink in color. I about crapped my pants. Right at that moment my son calls me on my cell phone to see how I am doing. He tects with me sometimes. I told him the story of the 2 rings while still standing over the hole and he is as excited as I am. We talk for several minutes and when I hang up I once again scanned the hole. Now only one target and it is reading gold. Could there be another one? One big scoop and out pops a beautiful bright gold large women's 14K gold band with a custom design. Unbelievable! I called my son right back to tell him about #3. At first he didn't believe me but he knows me pretty well and knew I was on the up and up. I have found some incredible stuff in the past but this "ring hoard" was a first for me with 3 very nice rings coming out of the same hole. It seemed like a dream with rings popping out of the ground left and right. I am guessing the rings had been there for many years. Someone probably took them off and laid them on their blanket only to lose them in the nice thick St Augustine grass. It was quite a rush that lasted for days and then It was back to searching for the next exciting find. I love this hobby. Thank you for reading. Christmas 2000. 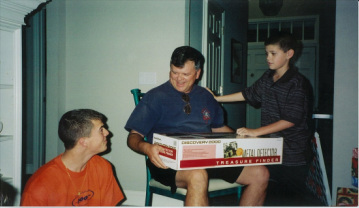 My 2 boys, Robbie and Murphy watch as I open up a Christmas present from my wife, my first metal detector, a Bounty Hunter Discovery 2000. 1. Fill in and manicure all holes. Leave the Land and Vegetation as it was or better. 2. Remove all trash and litter when I leave. 3. Respect the rights and property of others. 4. Observe all laws, whether National, State or Local. 5. Aid Law Enforcement officials whenever possible. 6. Never destroy priceless Historical/Archeological Treasures. 7. All Metal Detectorists may be juged by the example I set. Always conduct myself with courtesy and consideration for others.